A full spectrum recovery product for periods of intense training. Developed with feedback from the Olympic cyclist Chris Boardman, it helps your muscles to recover and rebuild. 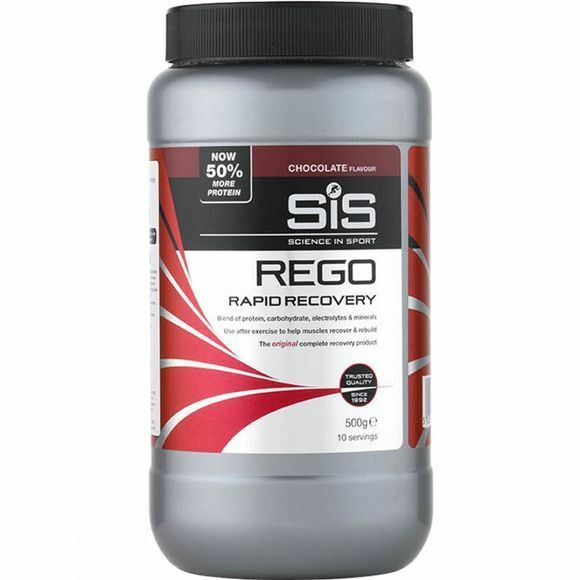 Use the Chocolate Rego Rapid Recovery Protein 500g immediately after exercise to help your body adapt to increased training demands, and become stronger as quickly as possible - ready for the next training session. When you are in a training programme and need your body to adapt to increasing demands. Easy on the stomach, so it can be taken after hard exercise, and is available in either soya or whey protein formulations. Carbohydrate mix (46%) (maltodextrin (from maize), fructose), protein (46%) (soy protein isolate), electrolytes (3%) (sodium chloride, potassium chloride, calcium lactate, magnesium oxide), natural flavourings, L-leucine, emulsifier (soy lecithin), thickener (xanthan gum), colour (beetroot red), vitamins and minerals (ascorbic acid, nicotinamide, alpha tocopheryl acetate, ferric pyrophosphate, zinc sulphate, calcium pantothenate, pyridoxine hydrochloride, riboflavin, thiamin mononitrate, calcium citrate, folic acid, potassium iodide, biotin, vitamin D3, cyanocobalamin), sweetener (sucralose).